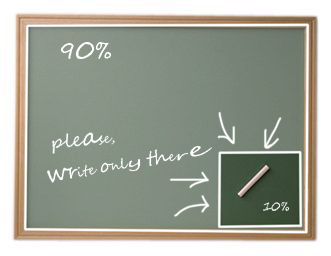 Do we use only 10% of our uh… Blackboard? Having just started my New Media Master, I find myself speculating about what digital learning may look like in a couple of years. Even though I believe that face-to-face interaction will remain essential to education, I do see high additional potential in digital learning environments, or also electronic or virtual learning environment. And we can take that many steps further. Following lectures via your mobile phone or using your mobile phone to be updated on timetable changes, absent teachers and such is no longer something of the future. But before I dare think about what that future might bring in this field, I think we first need to have a look at the here-and-now of our Blackboard-system. That is apparently not a platform that everybody is very comfortable with. But do we use it for all that it’s worth? Admittedly, I was fairly late with my registration for the Master’s in New Media study at the UvA. So I was not so surprised that some administrative matters had not been fully taken care of by the time my first class started. According to the administration, my registration at the University was fully processed and I should be an official UvA-student: hurray! Something seemed wrong with my Blackboard account though, I couldn’t see any of the information that some fellow student could see. Very mysterious indeed. Now, I don’t consider myself to be a digital illiterate, this wouldn’t be a very befitting study if I were, but one cannot help slightly doubting ones digital skills in this situation. In the end it turned out that my UvA-profile was not properly linked to the account. Now this is hardly a unique situation, I bet many of you have had such encounters with Blackboard, so I don’t intend to further wander on the topic. However, it did bring me to consider the ways Blackboard is used by educational institutes in general and the New Media study more specifically. I have used Blackboard several times before, at other Universities, but it has never impressed me. There’s much more to be done with it than I have seen up till now. I heard that and I believe it. There’s that truth about how we only use about ten percent of our brain, it’s the same with lots of computer software I believe: I’ve only seen the shadows of what Blackboard has to offer. This does not withstand the fact that apparently Blackboard is not a very intuitive platform. That is not only my own feeling, but I hear this all around me. I hear professors say ‘never mind Blackboard, we’ll arrange the course some other way’. Should this then not be a reason to reconsider the digital learning environment? There are more and more alternatives on offer, like Moodle. On top of this, implementing a digital learning environment is on itself some tricky business, wether it be Blackboard or some other package. Of course, a lot can happen as the year has only just started. And I am curious and cannot wait to be swept away by the possibilities of Blackboard… However, I am not fully confident this moment will come. And if it hasn’t by the end of the year, I reckon the New Media Master will have provided me with all relevant knowledge and experience needed to formulate a well founded advise on how to successfully implement a digital learning environment and what the next steps into the future of digital learning might be. In my opinion there is a very real benefit to using Moodle: it is Free and open source software. Meaning a) users can peek inside to see how it works, adapt it to their needs b) these adaptations can be shared and contributed back to the main project. And, c) anyone on any budget can host a Moodle course. Universities relying on closed-source software for anything as basic as a digital learning environment doesn’t seem right to me.